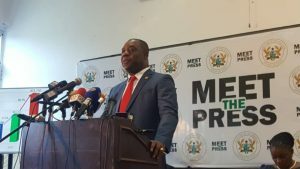 The Ministry of Education has refuted media reports suggesting the Minister, Dr. Matthew Opoku Prempeh, announced the award of diplomas to graduates of junior and senior high schools. The Ministry says the Minister was taken out of context. Media reports over the weekend suggested the minister had said a new curriculum for Junior High Schools in the country will see JHS graduates completing with National Higher Diplomas while qualified SHS graduates will be awarded with National Diplomas. “And that National Diploma will ensure that our kids can go straight to work. If someone can go with the Middle School leaving certificate into the army, why can’t someone go now with Senior High School diploma into work? That should be good enough that anybody who has passed and has a certificate should be able to be employed provided we have prepared that person,” he was quoted as saying. But the statement by the Ministry said: “The Minister did not state that junior high school graduates would be awarded a diploma” as the media reports suggested. “Indeed, given the government’s commitment to redefining basic education to include Senior High School…it is inconceivable that the Minister would suggest JHS graduates would be awarded diplomas or any other certification to enable them seek work,” the statement said.